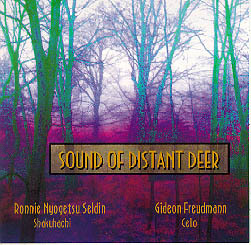 Gideon Freudmann Ronnie Nyogetsu Seldin "Sound of Distant Deer"
"Sound of Distant Deer," the first ever cello-shakuhachi duet CD ever released, features traditional and original music performed by two masters of their respective instruments. Gideon Freudmann, recognized as one of the most unique and original cellists in the country, teams up with Ronnie Nyogetsu Seldin, the leading shakuhachi (the japanese flute) instructor in the U.S., for this one-of-a-kind album. Sounding at times meditative, reflective, bizarre, and odd, this first-ever musical combination has yielded a result that is, quite simply, greater than the sum of its parts. The music on "Sound of Distant Deer" includes two ancient Japanese pieces, contemporary works written for these two instruments (though never recorded), and music specifically written and improvised for the album by Freudmann and Seldin. Gideon Freudmann, with three previous CDs (Banking Left, Cellobotomy, and Adobe Dog House), has long been recognized for pushing the envelope with his unique use of the cello. In addition, his odd and quirky songwriting has made him a staple of the up-and-coming singer/songwriter circuit. Ronnie Nyogetsu Seldin -- the foremost shakuhachi instructor in the U.S. -- first learned and studied the Japanese flute with his Japanese Grand Master instructor from 1973 to 1980. In addition to teaching students and giving concerts around the world, he runs the largest shakuhachi dojo in the world outside of Japan.